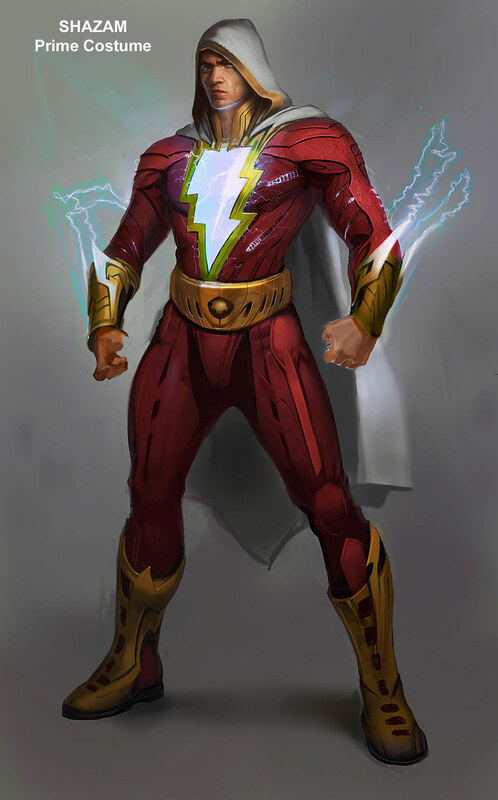 Bill Batson’s alter ego, Captain Marvel that was, master of the living lightning, Shazam smashes his way onto the already star studded roster of Injustice: Gods Among Us, trading blows with the crimson speedster in the latest Battle Arena footage. The Big Red Cheese looks like a one-man wrecking crew and I aim to break down some of the gameplay in these vids, normals, specials, super, to give you a feeling for how the hero plays. I’m going to tell you right now, I’m maining Shazam. He’s always been my favorite DC hero, and while I wasn’t too enthused with his appearance in MK vs. DC, his Injustice iteration looks absolutely sick. The concept art alone deserves some serious praise. The team at NetherRealm has transformed one of the most classic costumes in comics into an ominously radical harbinger of pain to come. You do know what I’m talking about right? I’m not a huge fan of the hood, but I personally think that he has the coolest costume of the entire roster. The electricity coming off his gauntlets is brilliant, and I hope they make an honest attempt to include that in-game. Shazam’s Battle Arena video gives a pretty good indicator of what he’s capable of. 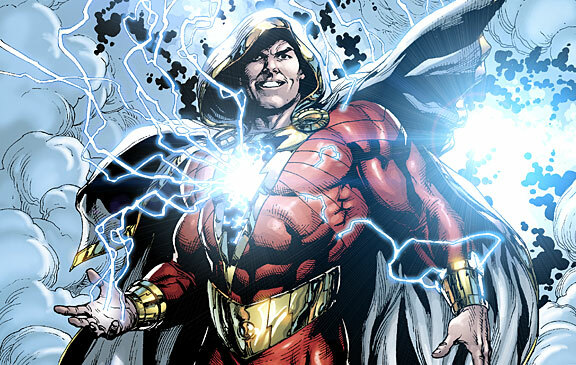 He has some pretty quick normals, special moves that give him some very interesting mobility options, EX attacks that really allow for a teleport, a ranged projectile, and possibly a powerup special… Man Shazam’s looking like a bonafide jack of all trades here! But let’s break down some of his specials in a little more depth here. The wizard’s avatar is strong enough to take down Superman, so it’s no surprise that he’s going to be throwing around marquee signs (:31) and water towers (1:30). I can’t say too much about Shazam’s normals unfortunately. He doesn’t look like he has a ton of range on any of his standard attacks. He has some punches and some kicks. That’s really all I’ve got for you. Courage of Achilles (:33): Shazam calls down the lightning, igniting his fists with eldritch electricity. This looks like one of the few power up speicals in the game and I’m guessing it powers up the Big Red Cheese’s already (likely) beefy damage. Speed of Mercury (:25, :44): I have to say that this teleport is the last thing I expected Shazam to be sporting. I know he had one in MK vs. DC, but he doesn’t really have anything quite like it in the comics. Here can teleport a short distance infront of him, going what appears to be completely intangible (maybe to both physical attacks and projectiles?) and closing the distance very quickly. While great for dodging attacks, this will be a key way to keep the pressure up after knockdowns that send the opponent flying. Strength of Hercules (:57) EX (1:04): Shazam hauls off, gathering his power, and unleashes a massive punch that, if it connects, causes a wall bounce for a big combo. The punch also has super armor at a certain point, and likely can be used to blast through overzealous mashers. The EX version is Shazam’s stage transition attack and appears to have armor upon activation instead of having to charge the attack. Power of Zeus (:45): I think we can count on this being Shazam’s go to projectile. He hucks a lightning bolt straight at his enemy’s face. It reminds me a lot of Sagat’s high Tiger Shot in that a lot of characters can probably duck under it. Still, this appears to be his only projectile, so I’m sure it’ll have its place when Shazam feels like zoning a bit. Lightning Strike (:58): Shazam calls down a bolt of magic lightning from the heavens to strike his foe. When utilized in combos it looks like it keeps enemies aerial long enough to follow up with extra hits, though this may only be possible in the corner. It recovers quick, quick enough for him to combo out of it, and depending on the block stun, this may be a good move to throw out if your opponent likes to whiff things just outside of normal range. Lightning Crusher (:27, :49) EX (:37): Reminds me of a combination of Raiden’s lightning flight attack deal and M. Bison’s psycho crusher. Basically he spirals through the air doing damage. Might be good for a quick punish? You’ll notice that the EX version does two hits – the lightning crush, and then Shazam throws them bodily behind him. It almost looks like this might have a hit of super armor, but from what I understand EX moves can really only be triggered on hit so… Maybe not? Lightning Tackle (:40) EX (:40): Shazam tackles his enemy and they get hit by a big ol’ lightning strike. If this is an unblockable command grab… Oh man I will be happy. However let’s just assume that right now it can only be used in combos. If it scores a knockdown it might be useful as a combo ender. The EX version bounces the opponent up with the lightning and Shazam can follow up with more punishment. I love how fluid his combos look, and his EX moves really add a ton of extra damage opportunities at the cost of lots of meter. Aerial Slam (:41) EX (:41): Our stalwart hero grabs his foe, flies into the air, and hurls them at the ground. Simple but sweet. 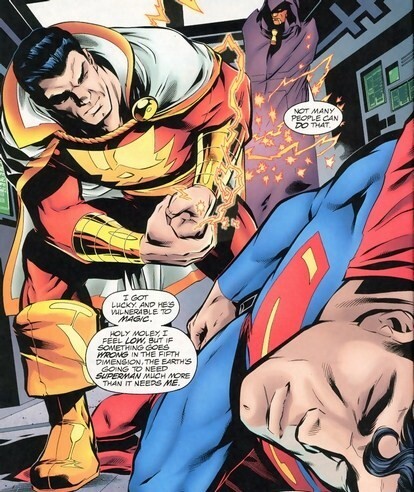 In the EX version Shazam spends a little bar to follow them down to the ground and slams into them feet first, bouncing them up into the air for a little extra damage. Like the Lightning Tackle, I’m unsure of the properties of this attack. Does it only work on airborne opponents in combos? Can it be used on grounded enemies? So many questions! High Voltage (1:52): Prepare for pain. Shazam uppercuts his unfortunate adversary into the stratosphere where he puts on a clinic in extreme electrical prejudice. Amidst stormy skies he lands a few bone crushing blows and elbows them back to terra firma, though before they can hit the ground he snatches them, spins the living crap out of them, and then sends them hurtling to the ground. It looks EASY as crap to land, and could be done off of nearly any EX attack, or even his Lightning Strike. It’s just a simple uppercut. Depending on the damage and how easy it is to build meter, this may be a useful addition to Shazam’s arsenal. I am LOVING the way Shazam looks in this game. His costume is one of the best, if not the best, in the roster and his combos look awesome as all get out. I also like that we can attribute almost every one of his special attacks to the deities that power him. The only people that seem left out are the Wisdom of Solomon and the Stamina of Atlas – Hercules, Achilles, Zeus, and Mercury are all accounted for. Right now, from what I can tell, he’s looking like a very very solid character. He has mobility, projectiles, a teleport, a plethora of useful EX attacks, and an easily comboable super. Prepare to get, THUNDERSTRUCK! I really hate that they never gave a Classic Captain Marvel DLC for this game. It also really bugs me that DC never took this game as a chance to introduce Billy as Captain Marvel to the general public.